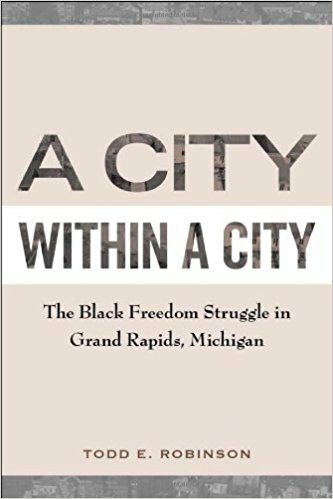 Chapter 4 of Todd Robinson’s important and insightful book, A City Within a City: The Black Freedom Struggle in Grand Rapids, Michigan, focuses on what he calls the Mustache Saga. The Mustache Saga is really about students, particularly black students asserting themselves around changing school policy and developing greater political and cultural consciousness. In the mid-1960s, the black community in Grand Rapids and across the nation, was organizing for more rights, more freedom and more power. It is within this context that the Mustache Saga takes place. Beginning with the 1966 school year, we begin to see students engaged in their own forms of resistance, that were both political and cultural. Responding to an increased crackdown on dress code and appearance, some students protested these standards growing mustaches. The Grand Rapids School Board spent most of their meeting on November 16, 1966 discussing the matter. You can read the proceedings from that meeting at this link. One other example of local media coverage of the Mustache Saga was an editorial from WOOD TV 8, which also ran on November 16, 1966. The editorial was condescending towards students and demonstrated a clear racial bias on the matter. We are posting the editorial since it is important to read in its entirety. 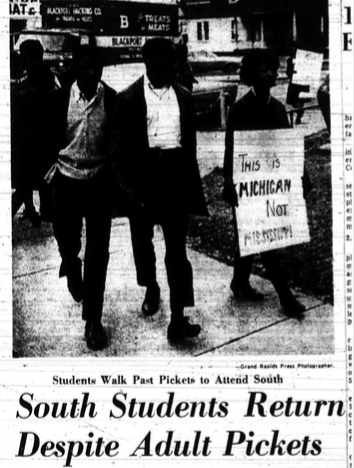 Lastly, it should be noted that this student led resistance to GRPS school policy was part of the growing anger and frustration that a growing number in the black community were experiencing, which eventually erupted in July 1967, after GR police officers abused and arrested black youth. That incident led to 3 days of rioting, which we have written about. This July will be the 50th anniversary of the race riot in Grand Rapids. 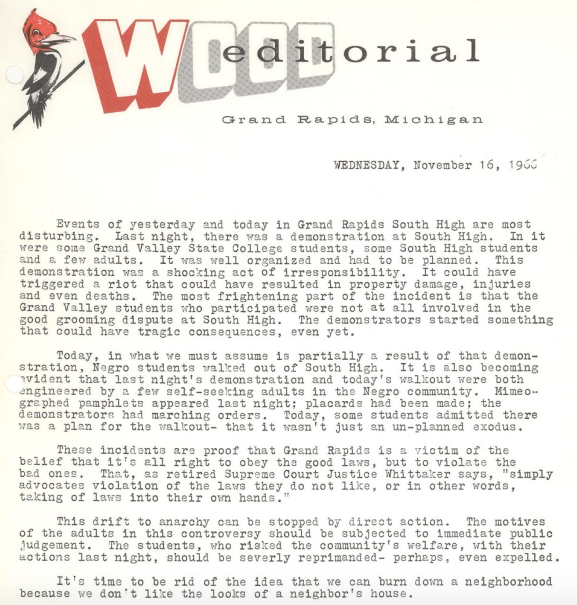 This entry was posted in Civil Rights/Freedom Movement and tagged black student resistance, Grand Rapids mustache saga, local media coverage of the mustache saga, South High student protests. Bookmark the permalink.